So, last December (or was it November? 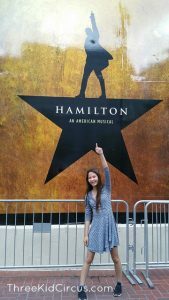 It’s a blur, sir) I spent hours in an online queue to obtain tickets for the San Francisco production of Hamilton. At that point, I’d heard parts of songs, but planned to go into the live show with the intent to experience it all for the first time at the same time. One week on a tour bus with an 8th Grade history class touring Pennsylvania and Washington DC ruined that notion but good. I ended up listening to the show start to finish dozens (hundreds?) of times before we set foot in The Room Where It Happens. You could buy six tickets at a time. I have five members of my family, so that sixth ticket was a subject of much discussion. Who would be our lucky guest? And by lucky, I mean, they’d get to see Hamilton, but they’d have to ride crammed into the back of our dirty minivan with the kids in order to get there, and they’d have to sit with us and endure us mouthing the lyrics and possibly weeping prematurely before all the sad moments. My sister ended up getting the nod, and we folded her up and tucked her into the van, where she kept her cool through some Very Theatrical Interpretive Singing and fighting over who got to be Burr for the ride down. Unlike me, my sister was basically a Hamilton virgin, having only heard a song or two, and having no idea about the whole story. So she had the experience I had planned on for myself, and she loved it, but in the end, I’m glad I was there in the audience, versed enough in the music that had something befallen a star, I could have not thrown away my shot. Anyway, it was absolutely amazing, and worth every penny. Plus, we all pose like this on the regular now. On April 17th, 2017, I gingerly wrote down my first Bright Line Eating meals. No sugar. No flour. No snacks. Weighed and measured portions. On the morning of April 18th, I carefully approached the scale, naked and cringing. At the last moment, I remembered to pull the hair elastic out of my ponytail and I placed it on the counter before stepping on the scale. The number that popped up was large. And I know that I had reached higher numbers in recent weeks, but hadn’t been willing to step on the scale. I wrote down the number on my food notebook, and went downstairs to eat my first no sugar, no flour meal. That first day was a revelation. As someone who took every opportunity to “stretch my legs” by wandering away from my desk and into the kitchen to grab a little handful of something, the no snacks thing was hilarious. I was plenty full from my Bright Line Eating meals, so I wasn’t hungry, but the impulse to wander into the cupboards and emerge with a grubby paw full of some treat was really strong. I felt like I suddenly had hours of extra time that weren’t being filled by kitchen explorations. I didn’t have to putter around opening cupboards and drawers wondering what to eat next, because I’d already planned out my food for the day. There was such freedom in that. Over the first few weeks, I struggled with scent triggers and learned to take a walk to escape the smell of things I wasn’t going to eat. As the days passed, and my brain started to heal from the barrage of sugar and flour that had kept me obsessing about food, I realized that my attitude towards food, eating and my body had changed. I wasn’t dieting to lose weight. I was a sugar and flour addict that was giving up the substances that were causing me to have no peace around food, health challenges that were compounded by the extra pounds on my frame, and I surrendered to the idea that eating this way could and would be my new way of life. Not because I was losing weight (although I was!) but because I could feel myself healing. Tomorrow is day 200 for me, and I’ve released 45 pounds. Unlike the first few months, when my body was losing weight at a rate of about 10 pounds a month, my weight loss has slowed down to about 3-4 pounds a month. I go weeks at a time without lower numbers on the scale and I’m not worried at all. Little changes add up over time, and I’m in this for the long haul. I can honestly say that I’m not mourning the end of sugar and flour in my diet. I’m happily eating more vegetables in a month than I ate in an entire year when I was a vegetarian. I’m confident I’m getting exactly what my body needs, and I’m looking forward to new side dishes for the holidays, based on my new and improved cooking skills that maximize freshness and flavor without leaning on helpers like sugar. So, 45 pounds released. One blood pressure medicine eliminated. My other blood pressure medicine cut in half. Eliminated meds for pre-diabetes. My silent reflux is gone. Swelling in my feet and ankles – gone. I still have 55 pounds to lose. It may take me another year to get there. It’s okay. I’m having a blast eating my way toward victory. My family still snacks, eats sugar and flour, and that’s okay. Overall, everyone’s food is improving, because we eat at home much more often, and we always have fresh produce and healthy options at meals. I’m not interested in policing or changing their relationships with food. I’m keeping my eyes on my own plate. I will say that they are asking for healthier proteins and dinner options in general, and the entire family’s food bill has dropped tremendously because we’re just not eating out very often. If you have any questions about Bright Line Eating, I have a link in my sidebar with more about the program and my experience with the BLE Bootcamp. I’d be happy to answer any questions here, or via email, too.